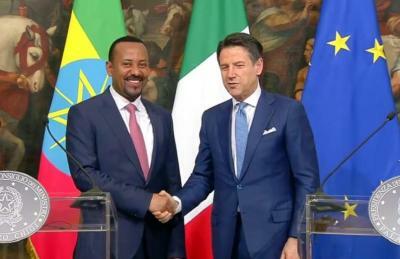 ROME - Italy has pledged to finance the feasibility study of the planned railway line that will link the Ethiopian Capital, Addis Ababa with the Eritrean port of Massawa, Prime Minister Giuseppe Conte assured the Prime Minister of Ethiopia, Abiy Ahmed, on a visit to Rome Monday. Conte visited Asmara and Addis Ababa last October. A few weeks before, Eritrea and Ethiopia had signed a second peace treaty. The first peace agreement, signed July between the two countries’ leaders, specifies the restoration of transport and trade systems. On the basis of this article of the treaty the Italian pledge of a project for the railway has been taken. Italy’s financing would be the first step towards a route that would be crucial to trade between the two African countries. In the 1990’s, a delegation of the then Italian State Railways, led by Sara Stefanelli, had gone to Addis Ababa to study the modernisation of the old railway connecting the Ethiopian capital to Djibouti. However, Italian technicians discarded the expensive and difficult hypotheses for this line. In 2016 the Addis Ababa to Djibouti line was modernised by the Chinese, although the gates for further development remain open given that it is the main import and export channel for Ethiopia. The conversation between Conte and Abiy Monday did not stop at plans for the railway. One of the key talking points of the meeting was of the Italian need to curb migratory flows. If Italy's borders are closed, Ethiopia continues to welcome fleeing refugees and, just a few days ago, the parliament passed a new law providing more rights for refugees. Ethiopia hosts 900,000 migrants in 26 camps. They will now have, among other things, the possibility of having free access to primary education and obtaining regular work permits. Prime Minister Conte also expressed his government's plan to tackle food insecurity and extend support to the soldiers returning from the Ethio-Eritrea border following the peace agreement between the two African countries. Prime Minister Abiy expressed his gratitude to the government of Italy. “We are excited and accept with great honour Italy's Plan to extend support on Ethiopia's plan to link Addis Ababa with Massawa via the railway,” said Abiy.